Specializing in light gauges, and narrow widths, aluminum, copper and stainless steel. We have slitting capabilities down to .0002" thick and .100" wide and our knowledge of the many applications and end uses for foil allow us to help your company with hard to find requirements. We can also customize a program to fit your specific needs. Ultra High Vacuum aluminum foil is virtually contamination free. This means the foil is “A” wettable and completely free from oils normally found on other grades of aluminum foil. UHV foil is produced on plastic cores. Each UHV Roll is also enclosed in a free plastic dispenser box and wrapped in film. This is important for customers who require that little or no contamination infiltrates their environment. Ultra High Vacuum aluminum foil is a critical part in developing an ultra-high vacuum. Most vacuum chambers are constructed of stainless steel. When a steel vacuum chamber is opened or develops a leak, atmospheric air can enter the chamber and create a thin layer of substances. These substances include water vapors or hydrocarbons. Once the leak is repaired and the chamber closed, the left over residue will disrupt the ability to achieve a high vacuum by gradually releasing a stream of molecules as the air is pumped out. This prevents the chamber from being emptied enough to conduct proper research. To remove these substances, a “bake out” of the equipment is performed. 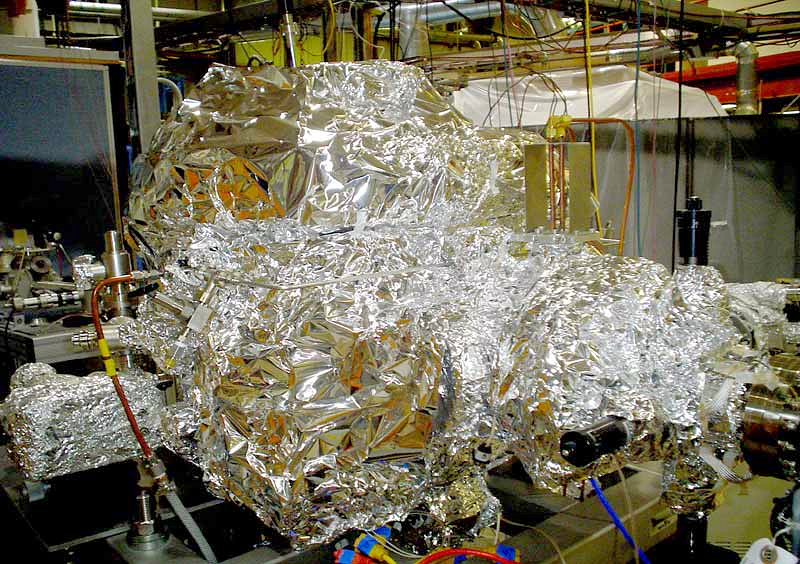 The equipment is blanketed in UHV Foil, wrapped with electrical heat tape, and covered in foil again. The electrical heat tape is used to heat the metal chamber just enough to loosen any residues while the aluminum foil helps to spread the heat evenly. *Many of our materials meet industry specifications including DFARS, REACH, RoHS, and various MIL-SPECs. We do not charge a fee for issuing this documentation or Certificates of Compliance. UHV-Ultra High Vacuum foil is suitable for use in clean-rooms and vacuum chambers. Wrapped in plastic and packed in a plastic box, this foil is "A Wettable" per ASTM B-479 Para. 3.1.4 & 10.3.1. It is also meets QQ-A-1876 Type 1 Grade B tested using the Aluminum Standard Association's test method certified by our mill. Coils are tested individually during our production process for compliance to the "A Wettable" condition.